Hanoi (VNA) – The 15th session of the 14th National Assembly (NA) Standing Committee opened in Hanoi on October 11, with an agenda focusing on reports which will be submitted to the legislature’s upcoming fourth meeting. 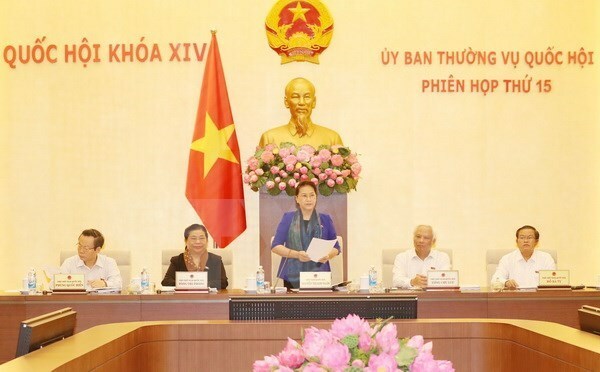 In her opening remarks, NA Chairwoman Nguyen Thi Kim Ngan said documents to be discussed during the two-and-a-half-day session include a report assessing the implementation of the socio-economic development plan and State budget in 2017, as well as the socio-economic development plan and State budget estimate and allocation for 2018, among others. The committee will also give opinions on the plan to use Government bond capital for the Ca Pass tunnel project and personnel preparation for the posts of Minister of Transport and the Government Inspector General, the top legislator said. Immediately after the opening ceremony, the NA Standing Committee deliberated reports summing up opinions and petitions that voters and people sent to the NA’s fourth session, and supervising the settlement of voters’ petitions sent to the third session. The committee heard that voters have sent 2,306 opinions and petitions to the fourth NA meeting, and 2,458 out of 2,868 petitions sent to the third meeting were transferred to relevant agencies for settlement. Among the petitions, 139 concerned the operation of the NA, most of which called for further renovation in law making and enhancement of efficiency of the NA’s supervising and hearing activities. Addressing the session, NA Vice Chairwoman Tong Thi Phong pointed out that 570 petitions have yet to be fully settled, urging relevant agencies to promptly settle the remaining petitions. Ministries and agencies should coordinate with each other to clear up petitions and concerns of voters and people, she said, stressing the need to intensify the legislature’s supervisory work and promote the communications role of press agencies.